An elephant camp neighboring our park has decided to try out our concept of care. 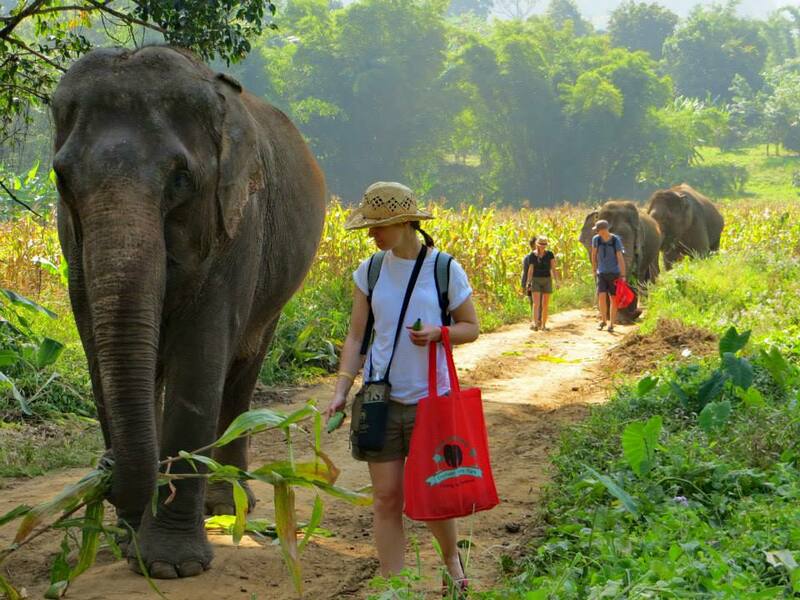 So now four lucky female elephants have dumped their trekking seats and their mahouts hooks have been cast aside. 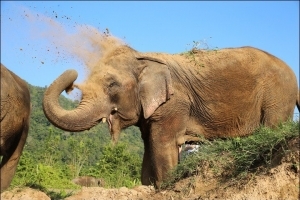 Only small groups each day enjoy the honour of observing their freedom and happiness; they walk, they scratch, they swim, they eat, they dust bathe... all at their own pace... May this be the start of a new trend that catches on in the Mae Taeng valley and elsewhere. 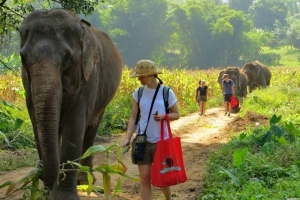 Starting From: 8:00am - 8:30am Pick up from your Chiang Mai hotel or you must be at our office at 7:40am. 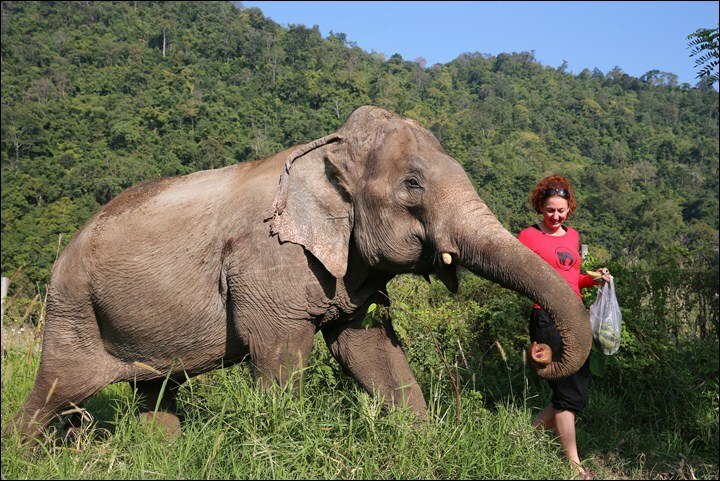 A film shown enroute teaches you about the project and Elephant Nature Park is followed by a safety talk by your guide. 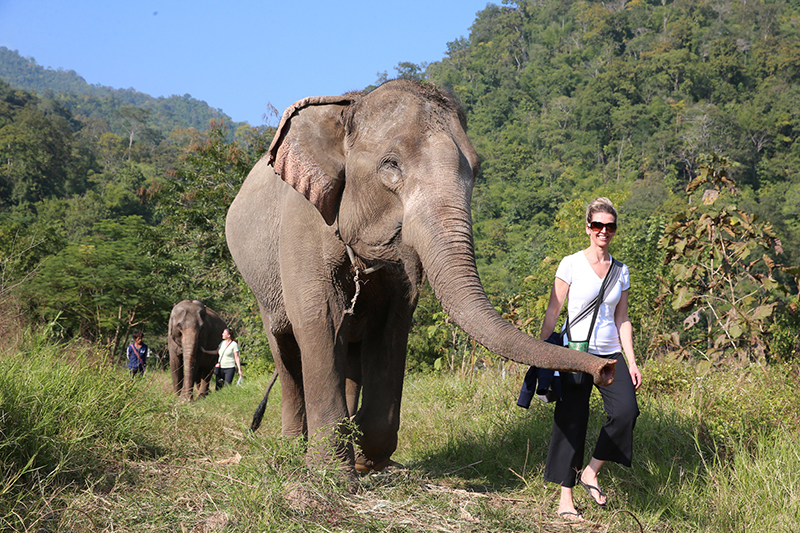 Meet and feed the elephants before starting your elephant walk into the surrounding forests with the herd. Enjoy a vegetarian picnic lunch in these beautiful surroundings. When you return to the river you bathe the elephants in the river and head back to Elephant Nature Park on a river raft, or by van (depending on river levels). Enjoy more time with our herd before a tea/coffee break. We leave the park and should be back in Chiang Mai by 6:30pm. 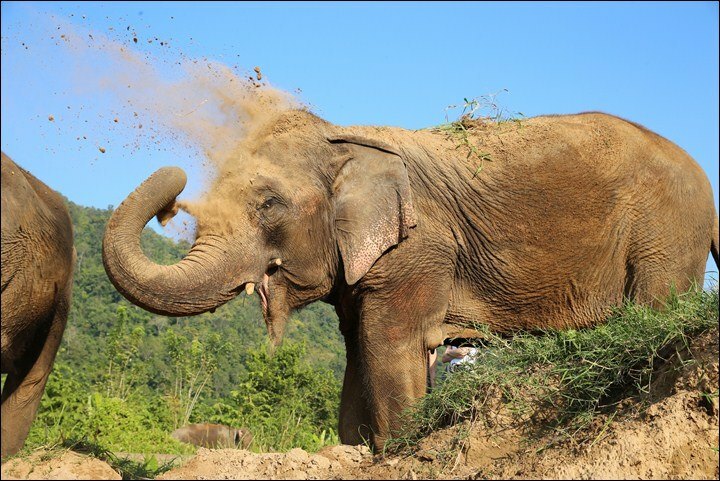 With no riding, this special program is focused on taking your time and allowing the elephants to enjoy each moment of their freedom, scratching, rubbing, throwing dirt ... so be patient, enjoy the view and take lots of pictures. Returning: around 6:30pm to Chiang Mai city. What to Bring: Hat, Sunscreen, Sandals/Flip Flops, Change of clothing for river bathing, towel, Shoes for walking, Camera, Bug Repellent, Refillable Water Bottle. Fitness Level: Capable of walking an hour in mountain terrain. 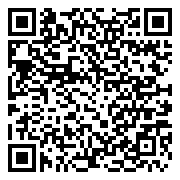 Bookings close: 2 pm (GMT+7), on the day before you are due to visit. A deposit is required to secure your place(s).